I did a little more work on a decal design. I'm nearing a final idea and am about ready to have a few made. I was initially wanting to have a really cool colour scheme with it but due to my lack of graphic design skills the only way to get the scheme I would really like would cost me more than I'm wanting to dish out since I would need to pay someone to draw it up. So for now I'm looking at keeping it simple, a white decal with a red star! That's right, I've lost the ".blogspot.com" extension to the name and bought a proper domain name. From here forward it's simply www.technickslide.com! The blog might also be looking at obtaining a lovely makeover here in the near future! 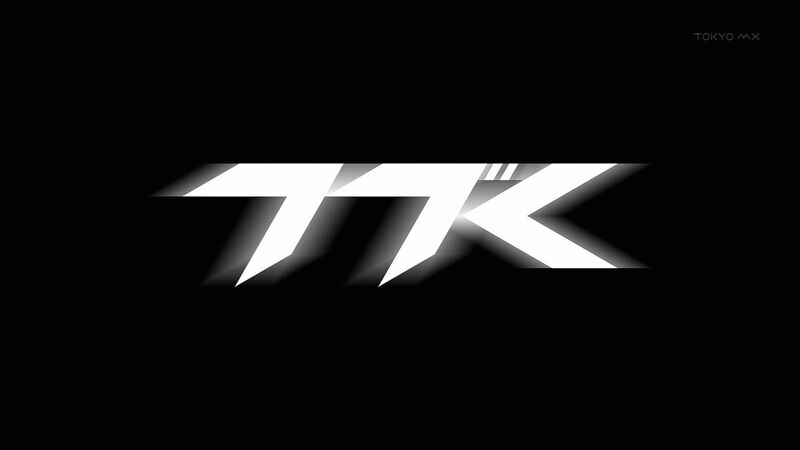 I would like to thank everyone who's been following the blog and I hope you all continue to follow along with all of my drifting adventures! 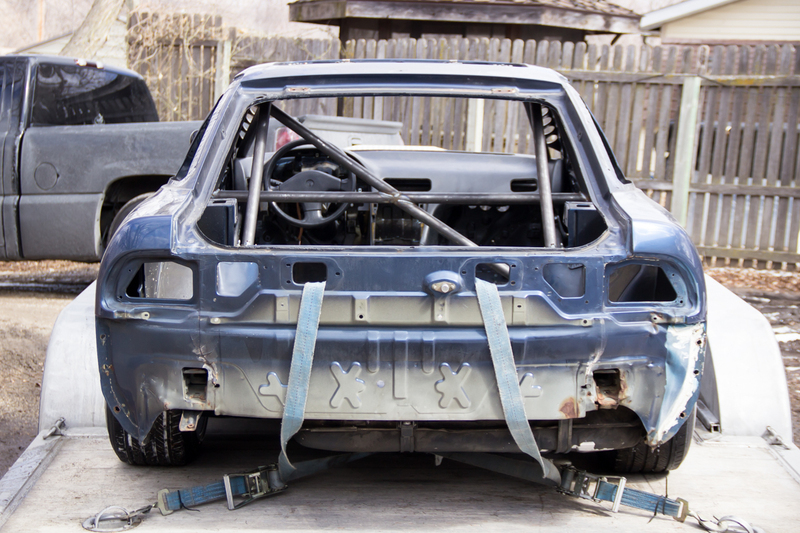 Becca's 510 is being prepped to have some serious work done next month so make sure you keep checking back to see what's in store for that lovely lady! 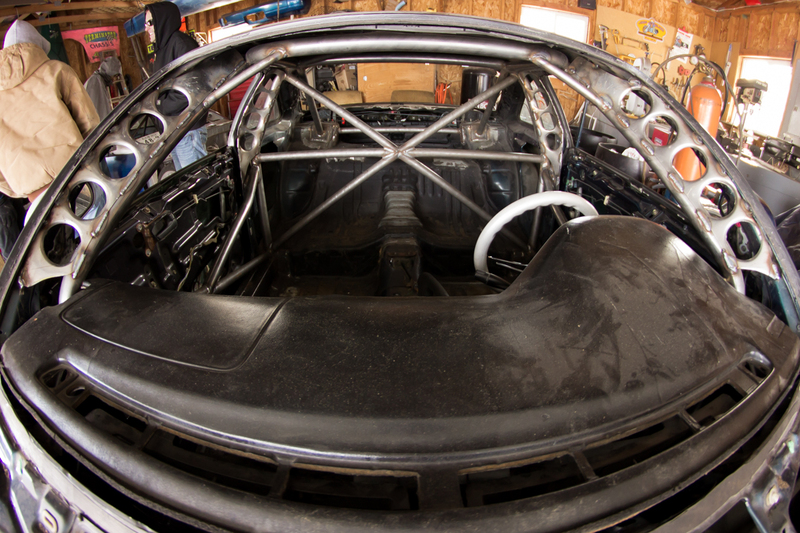 Last weekend I received a text from Travis telling me he had finished up the cage in Luke's S13. 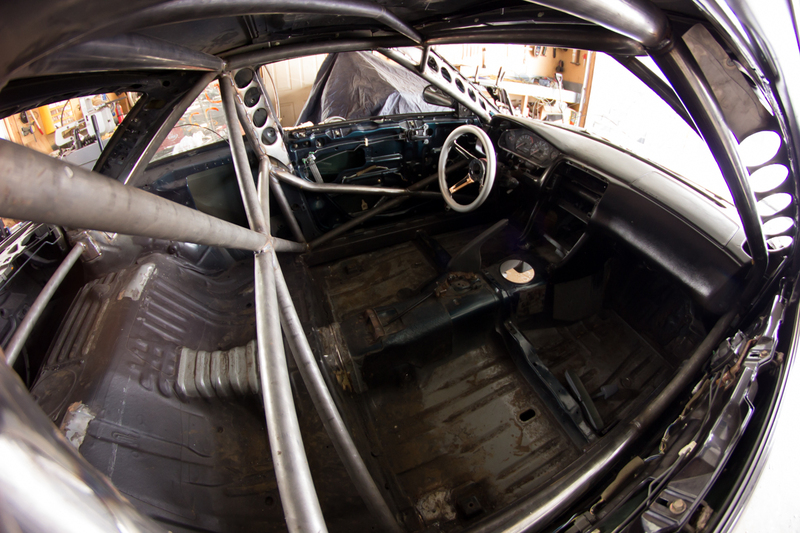 Excited to see how it turned out I jumped in my car Sunday morning and set sail for Shiomi Garage to take pictures and make a finalized plan on when to bring the 510 up. A quick drive north and I had arrived, this time there wasn't much snow in the driveway, and the temps were a lot better. 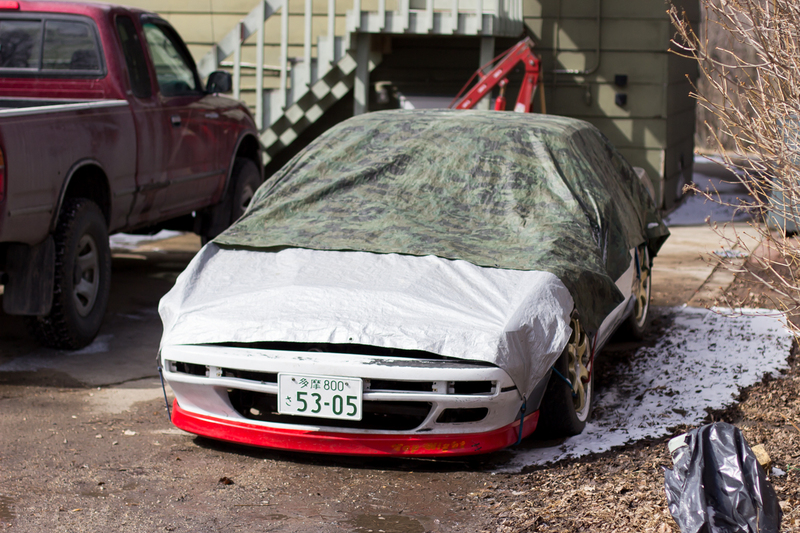 I rolled up to the place to find the coupe looking at me under a tarp, it had been moved around the driveway in preparations of being worked on next after Luke picked up his car. 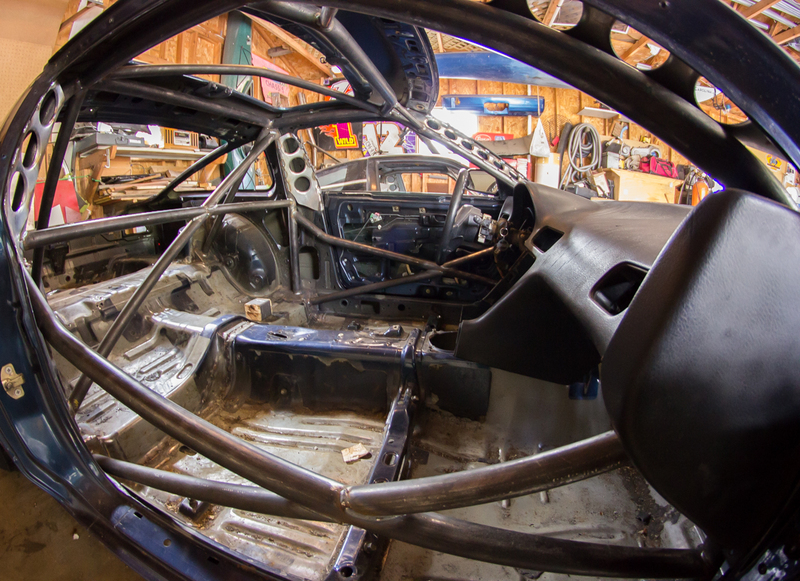 Then before he made his way outside to greet me I took a quick look at the hatches sitting in the garage. Soon enough Travis was outside and it was time to look the cage over and snap a couple shots. 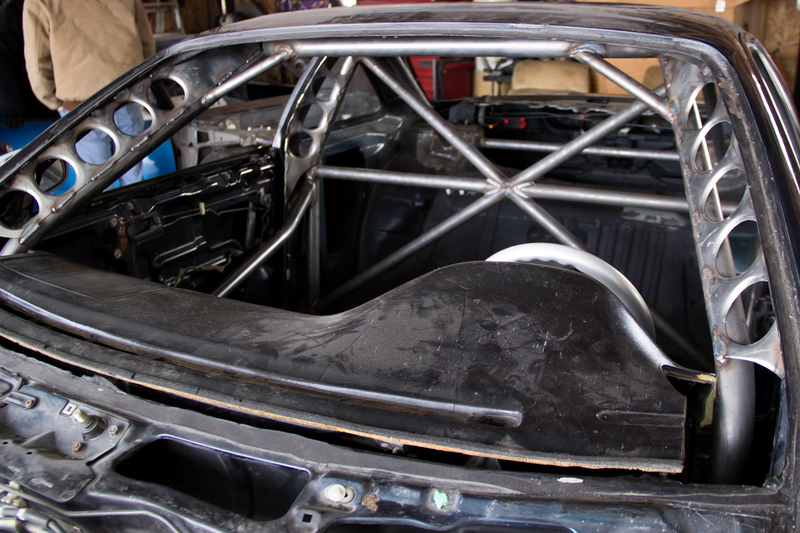 Looking the cage over I was quick to notice it was designed just like his Sil80's cage, only Luke had opted to go with X bars instead of ladder bars. I must say, it was a million times easier to climb in his car than climbing into mine. Of course there weren't any seats in his car at the time, but I could still tell his will be much more simple to get in and out of. 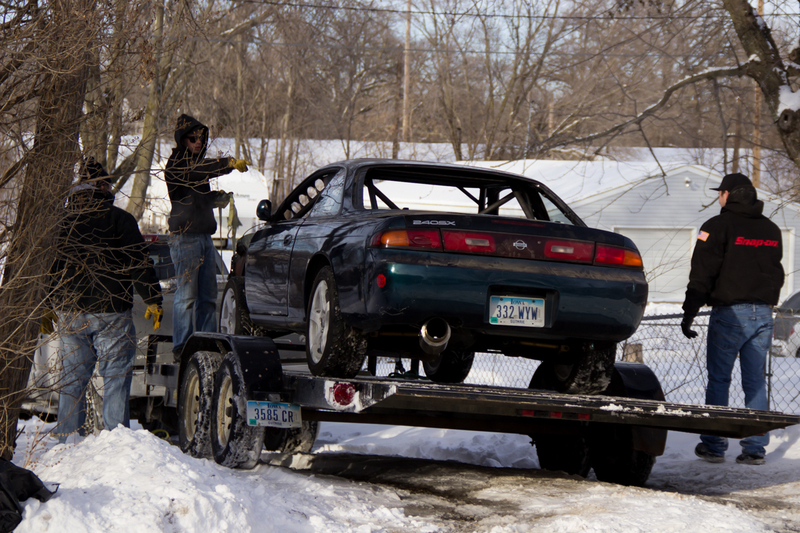 Shortly after looking things over Luke had arrived with his trailer and it was time to move the car out in the daylight to prep loading it up. I could see Luke was incredibly pleased with the cage, and like everyone else that's seen Travis's welds he was blown away by how amazing they were. This then lead to Travis pointing out what he thought were flaws in 2 of his welds... Just to quickly specify for those that don't know, a flaw to him looks like something that was still done by a machine. I don't understand how he see's them as flaws but I guess when you're that good at welding you can notice small differences that someone like myself would be none the wiser about. Even Luke was baffled by how high of quality standards Travis holds himself up to. Another happy customer for Shiomi Garage! It's always nice to see people pleased with the work done from here. 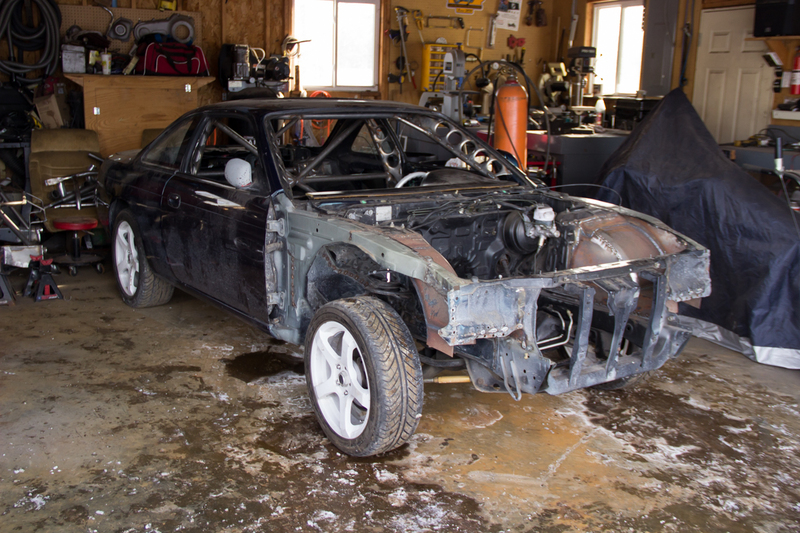 Now that Luke's car is all finished up it's time for the coupe to get some love and attention. The tarps were removed and it was now ready to be pushed inside. I'm excited to see how this thing turns out. 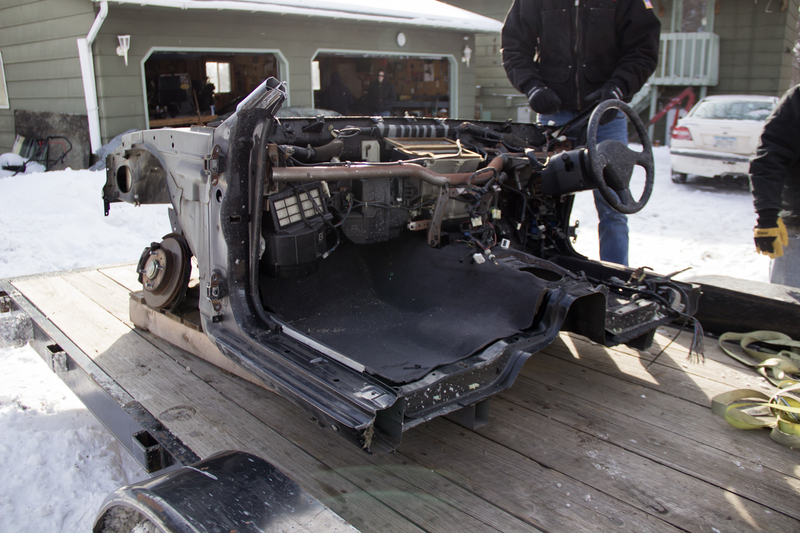 I helped push the car inside where Luke's car had been sitting, then went inside the house to talk about all sorts of cool things. Before I knew it hours had passed and sadly it was time to leave. Can't wait to see what's in store for my next journey up there! Over the weekend I decided it was time I made a trip up to Shiomi Garage. It had been a while since I was last up there, so I wanted to go really badly. Plus, Travis was also interested in buying some wheel spacers off Becca and instead of shipping them, a visit sounded like a much better option. 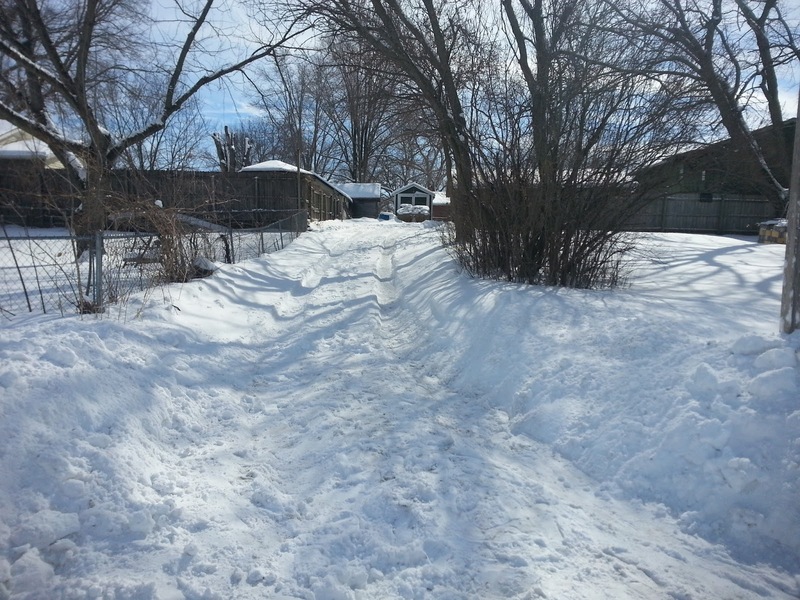 This picture was after shoveling and working on it. As you can see, Shiomi Garage seemingly has a touch of a literal meaning behind the name with a driveway resembling Mount Shiomi. After laying down some salt, it was time to go inside and warm up. 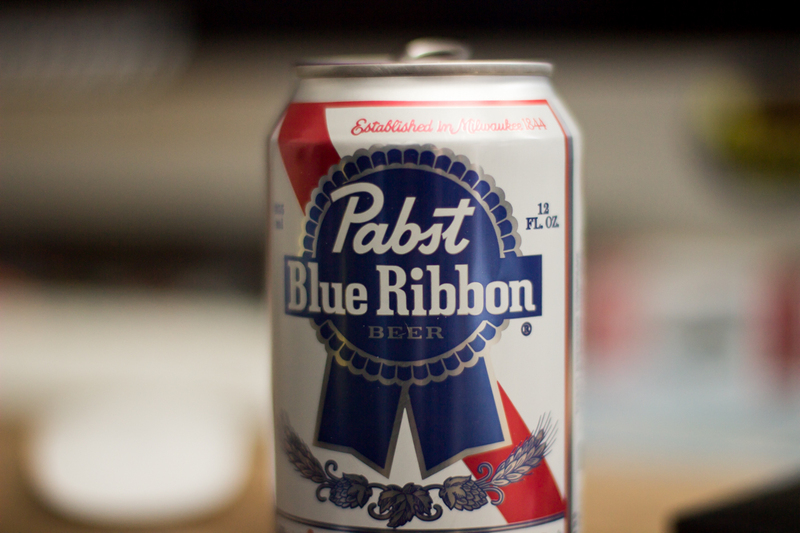 I brought over my collection of Video Option and D1SL DVD for Travis so we watched one of those and cracked open some PBR while we waited for everyone else to arrive. Some time and a few beers later, everyone else had shown up. Time to get up, and prep for taking photos in the -4 degree temps outside. Seriously, -4, I have no idea how he does it. He built the whole cage in this weather, no heater or anything to be found in the garage. You'll notice a good portion of the floor has a layer of ice over it even! I was really diggin the cage. Always killer fab work to look at! 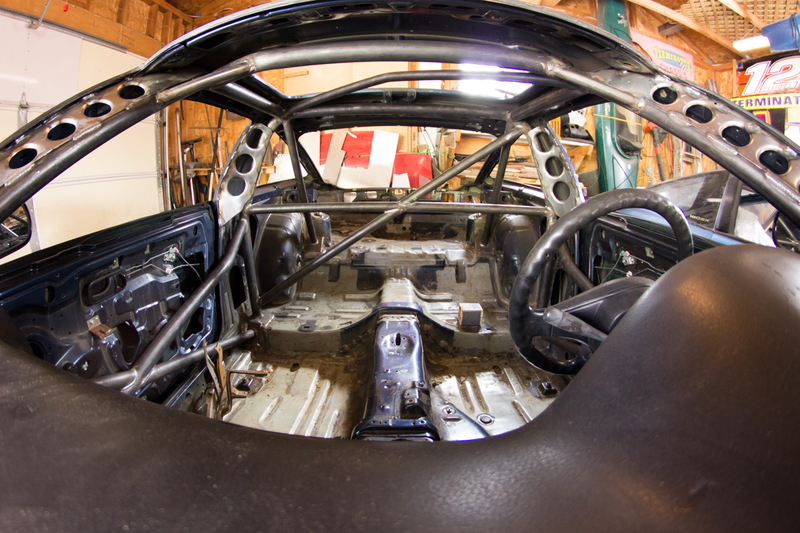 Between snapping some pics of the S14 I noticed Brett had found his way into the Sil80 which he looked rather comfortable in. Back to the cage, I found everything very pleasant to look at. 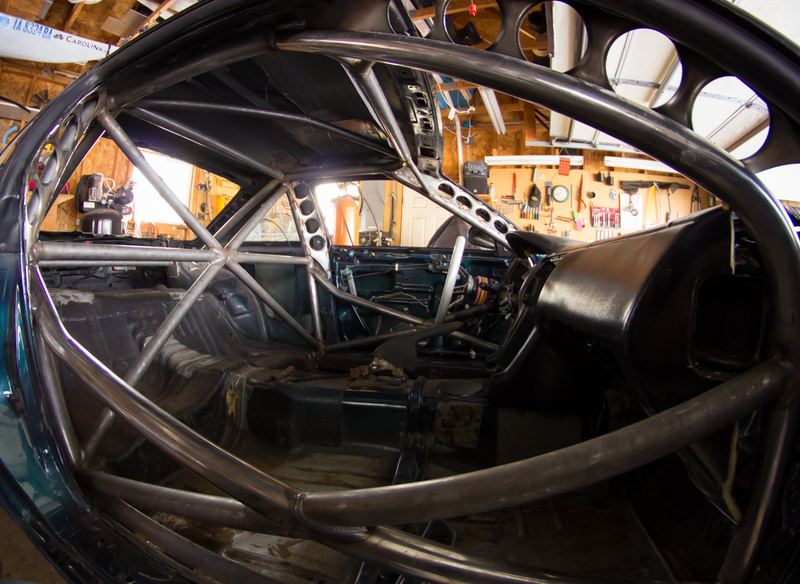 It was all nicely tied in together with welds that look so good you find yourself questioning if it was done by a machine and not a human. A skill I wish I possessed, maybe someday I can have him teach me to weld like he does. Moving on to the front you'll see the car has been tubed for more wheel clearance. 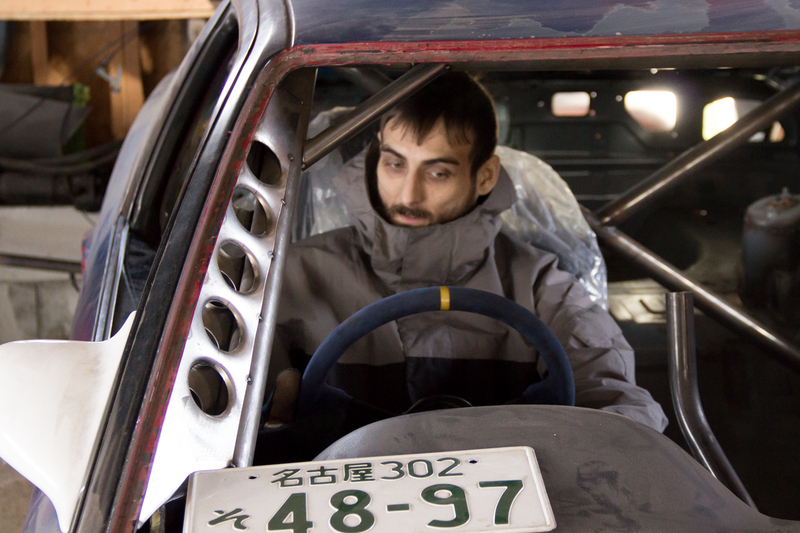 This however wasn't done up at Shiomi Garage, but still killer to look at and suits the overall appearance of the car. 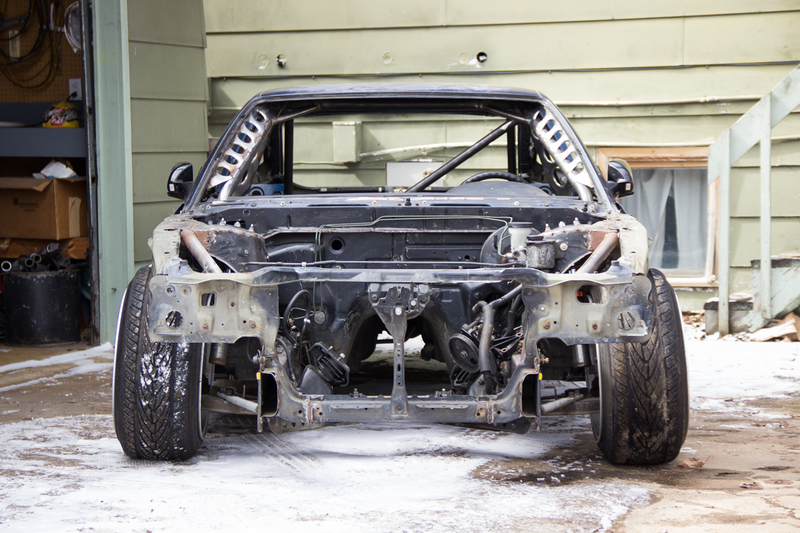 After looking the car over it was time to unload the RHD S14 front clip that Hodges had brought up with him. Which leads me to question... Does this mean Shiomi Garage is going to be getting a 3rd car!? 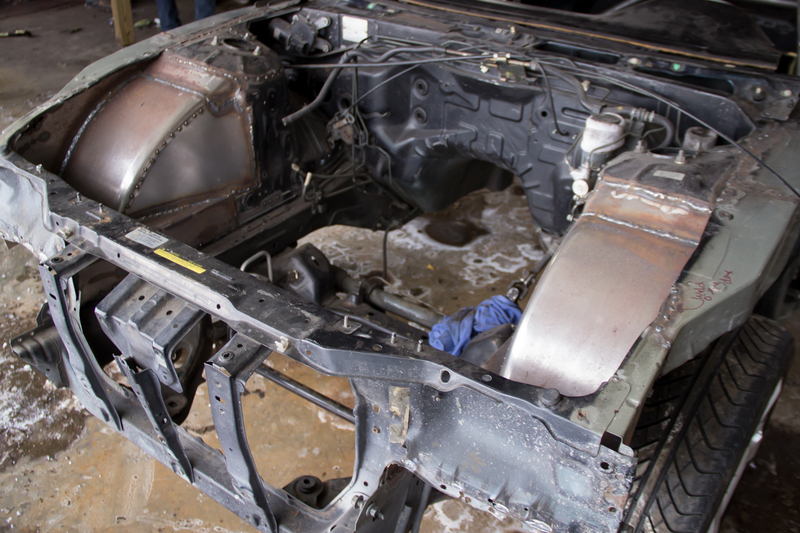 Along with the front clip came a complete S14 subframe with all the arms, diff, knuckles, and hubs. Heck even the brakes came with it as well. 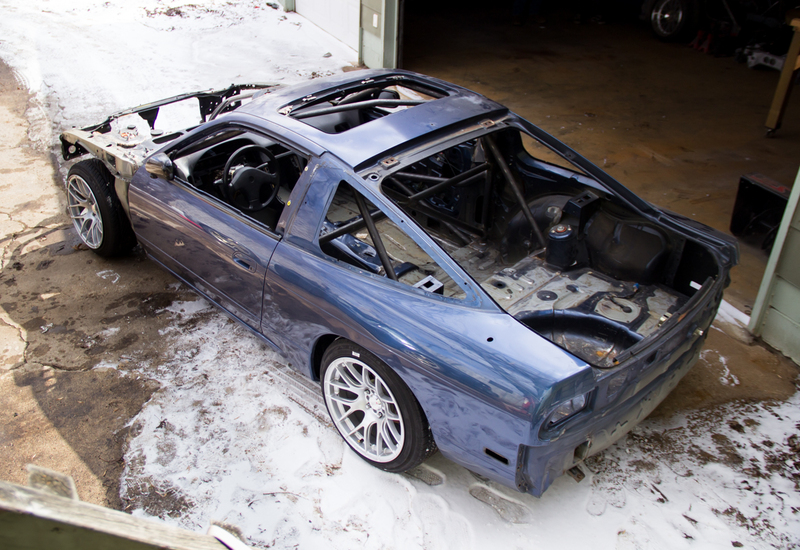 I spoke to Travis about it a little bit and he told me this might find it's way into the Sil80 since the S14 has better anti squat over the S13 subframe. 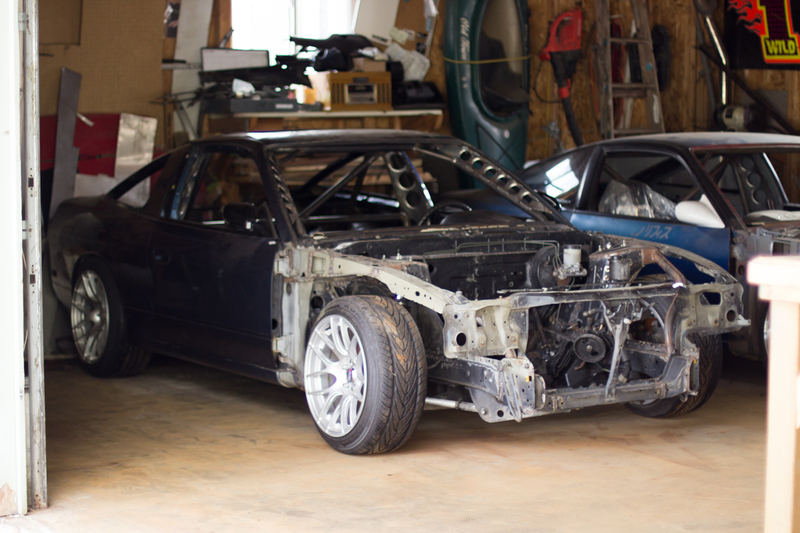 Off came the clip and subframe, and on went the S14. Unloading and loading everything was rather nice and easy, mostly due to the fact there were 8 of us there to move everything. Just like that, Hodges was off and on his way back home while a few of us stayed a bit longer. 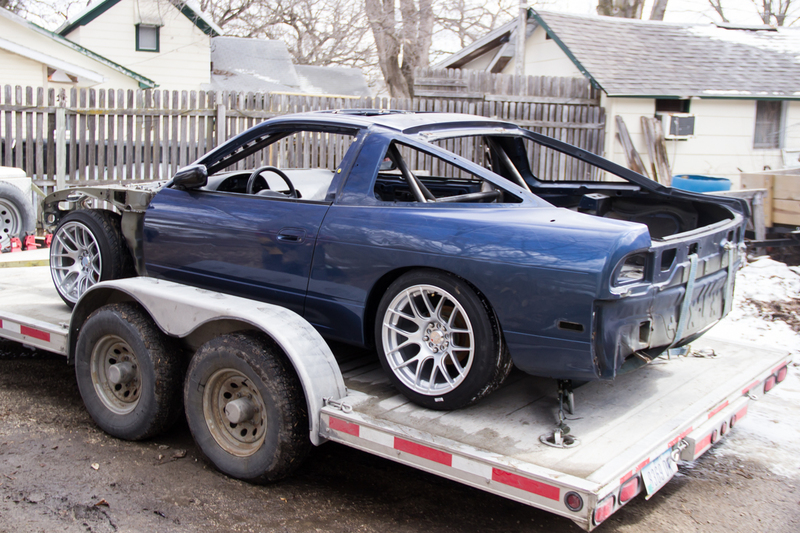 Luke had brought up his S13 to have a cage done that needed to be unloaded. Funny thing was I didn't even notice that happening, I had stopped inside to warm up for a minute since my fingers were frozen from taking pics without gloves on. 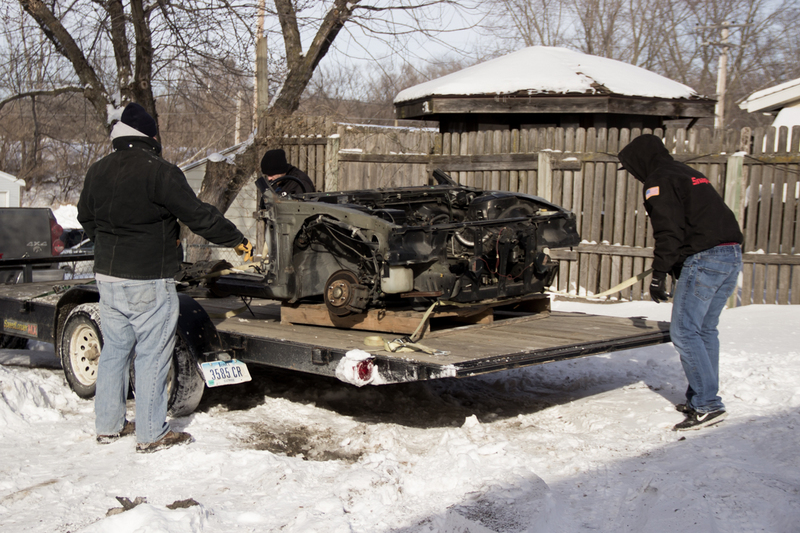 Before I knew it I turned around to hear the car was already in the garage and I had still yet to thaw out. Sadly I completely spaced on taking pics of Luke's car, but no worries. I'm sure I'll be making another trip up there soon enough to take a few. 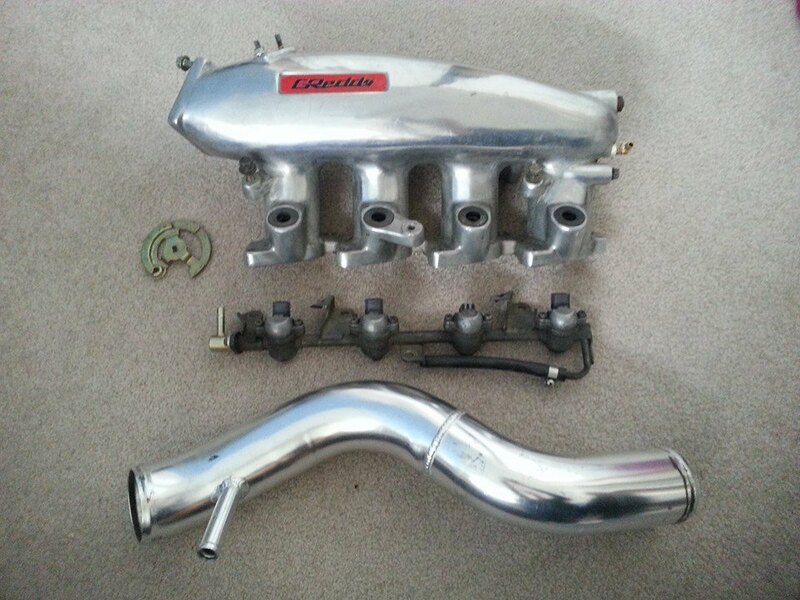 Just the other day when speaking to my friend Brett, I found out he had a GReddy intake manifold, along with cold pipe, S14 throttle wheel (needed for installing on an S13), and some stock injectors/fuel rail he was looking to sell. The deal he offered turned out to be one of those, too good to pass up deals. So I dipped into my turbo funds and picked this package up. I'm really looking forward to installing this, my engine bay is an absolute mess and could use some serious TLC. Plus this baby should help with making slightly more power too.